7 inches (18cm) wide at cast-on edge, 17 inches (43 cm) wide at fan-edge, and 25 inches (63.5cm) long. This pattern was originally published in a kit for Yarnover Truck’s Club. 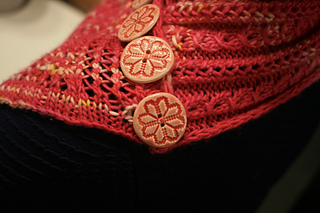 This gracefully shaped cowl is inspired by the micro-photography of the tiny organism called Licmophora flabellata. A rare symbiotic diatom (a single-celled algae), the delicate fan-shaped structures show beautiful patterning when you look at them through a microscope. 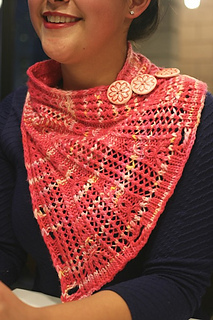 Combined with the buttons, the unique shape enables this cowl to be worn in a variety of ways-as a shawlette, as a tubular cowl, and styled like a handkerchief. This cowl is knit flat in one piece, from the narrow end to the wider, fan-shaped edge. Periodic increases shape the piece. 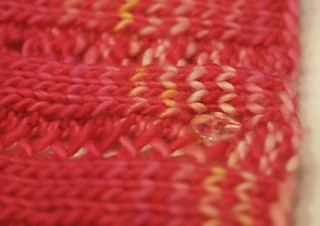 Yarnover buttonholes are worked along both edges during the final chart, and two-row buttonholes are worked near the final edge. Yarn: 185 yards (170m) of worsted weight yarn. 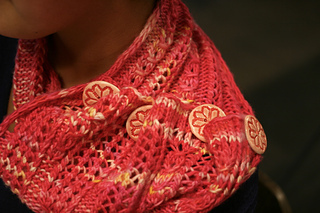 Shown in SpaceCadet Capella (100% Superwash Merino Wool, 195 yds (178m)/100 g), in ‘Pasadena’. Gauge: 18 sts & 24 rows = 4 inches (10 cm) square in stockinette after blocking. Needles: 5mm (US 8) straight or circular needles for flat knitting. Finished size: 7 inches (18cm) wide at cast-on edge, 17 inches (43 cm) wide at fan-edge, and 25 inches (63.5cm) long. Notions: Four 1 3/8 inch (35mm) buttons, 4 backing buttons (see note), needle and matching thread, tapestry needle for weaving in ends. Techniques used: knit and purl, k2tog, p2tog, ssk, k1tbl, p1tbl, slipped stitches with yarn in front and back, yarnovers, quadruple yarnovers (with instructions) to make a buttonhole, pkok and INC pkok (instructions included), backing buttons, 2-row buttonhole (with instructions), knit/purl long-tail cast on (video tutorial here: https://youtu.be/L7MKMlzVNzM) in pattern. Pattern is both written and charted.